Hetty . Wildlife Photographer extrordinare ! Hetty, who is our youngest of the northern [ as opposed to southern ] grandchildren, took a few photos whilst staying at Willowbog over the weekend. 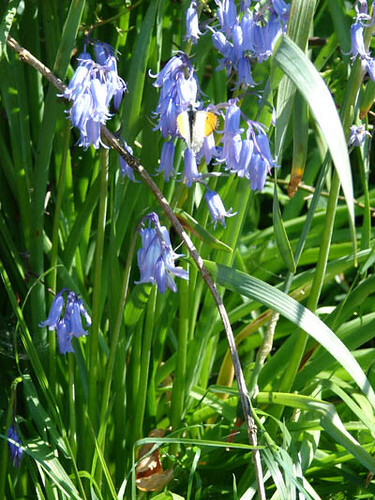 Feeding on the Bluebells in the centre of the picture is a male Orangetip butterfly , one of the early Spring flying species ……. at the end of May !!! 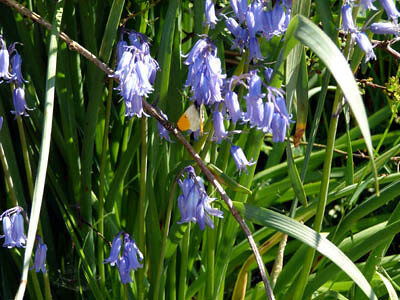 You can see the orange tips from which it gets its name , a little more vividly in this shot. 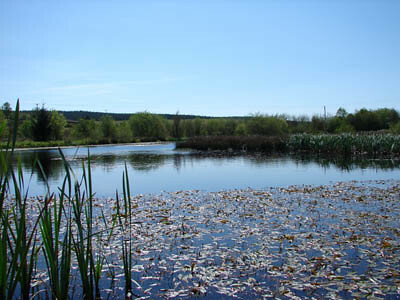 What a nicely composed picture of the main pond here !! Not bad for an eight year old ! Well done Hetty ! 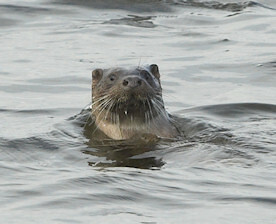 Two otters together , the same tow that did for the Canada goose eggs ?? probably but no way of knowing of course, the two animals climbed out onto the far bank and played around for some time before disappearing down into the water course beyond the pond. I watched them through the telescope and had the best views by far that I have had of this lovely creature !! Still hope that they did not get the Little grebe eggs though ! 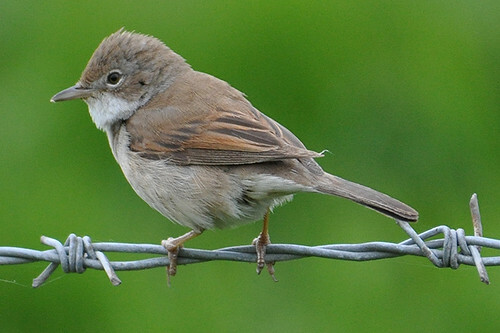 We had Common whitethroat in the garden this morning. This is a common enough member of the warbler family though it is one that we see all to rarely here at Willowbog. Not my photo by the way. This photo taken early this morning from our bedroom window shows one of the many reasons why it is a joy and a privilege to live here. 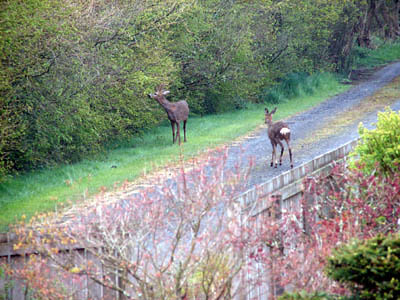 A buck and doe roe deer about 30 metres from the house coming up the drive from the shrubbery area. There are lots of roe deer in the surrounding forest and it is quite common for us to see them on the farm and often, particularly in snowy weather, even in the garden. They can , of course, do a fair bit of damage to plants and trees but it is worth it to get sights like this. A pair of Mute swans turned up on the main pond yesterday , no way of knowing, of course, if they are the same ones that were here off and on throughout the winter. A couple of Black Headed Gulls this morning, we used to see this species a lot more than we do now , in fact a few years back I even began to wonder if they were going to start breeding here , but nothing happened. No sign as yet of the Canada geese having another attempt at nesting after their Otter experience, but they are still about. Another summer visitor checks in. 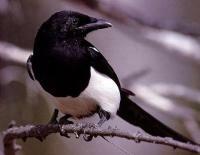 This bird is one of the main success stories of our pond and wetland creation of the past twenty odd years. Our first record of the year for Sedge warbler today. This species was never seen on this land prior to 1990 when we began to make the changes to, what was until then just rather poor grazing land. In the next few days we will be hearing five or six male Sedge warblers singing to mark their territories at various points around the ponds.